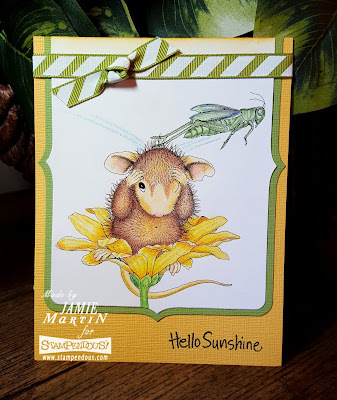 This week the Stampendous Design Team is sharing super cute House Mouse projects with a Spring theme. This stamp makes me smile every time is see it, with that little grasshopper jumping off the mouse's head. 1. Stamp Grasshopper Leap on white paper with black ink and color with colored pencils and watercolor pencils. 2. Cut image out with Fitted Frames and frame it with green paper. 3. Glue to a yellow card and trim off the to make it straight. 4. Tie the top with ribbon and stamp the sentiment at the bottom of the card black ink. Stop by the Stampendous Blog to see what the other Designers have made today, I have the link below. Stay connected and don't miss a thing! Tag! Your it! LOL So cute! Hahaha ... so funny ... a fun card ! Oh how hilarious this image is!! Adorable card and your coloring is amazing! Jamie Martin I'm a California girl living and stamping in Oklahoma. I love being on the Design Team for a few great stamp companies, Stampendous, Rubbernecker Stamps, Whimsy Stamps and Honey Doo Crafts. Thank you for stopping by and I hope you find some inspiration here today. Email Subscriptions-Get Updates of new posts! Visit Jamie's profile on Pinterest. Design Team Member for Stampendous! Companies Contributing Product- Thank You!